Eureka Entertainment have announced that they will be releasing a gorgeous new HD restoration (undertaken exclusively for this release) of Floating Weeds [Ukigusa], one of the most acclaimed films by Japanese legend Yasujirō Ozu (Tokyo Story; Late Spring; Early Summer; An Autumn Afternoon; Good Morning). Starring iconic Japanese actors Chishū Ryū (Tokyo Story; Red Beard), Machiko Kyō (Ugetsu monogatari; Gate of Hell), and Haruko Sugimura (Kwaidan; Late Spring), the Dual Format (Blu-ray + DVD) edition, available on Blu-ray for the very first time anywhere in the world, will be released alongside a DVD-only edition on 3rd December 2012. Towards the end of his career, Ozu returned to a story he had made some 25 years earlier as a silent, Ukigusa monogatari [A Story of Floating Weeds], for a magnificent colour reworking, photographed by legendary cinematographer Kazuo Miyagawa (Rashomon, Ugetsu monogatari). When a travelling theatre troupe brings their show to a seaside port, Komajurō (Ganjirō Nakamura), an ageing actor, is reunited with his former lover, sake bar owner Oyoshi (Haruko Sugimura), and his illegitimate son Kiyoshi (Hiroshi Kawaguchi), to the distress of his current mistress Sumiko (Machiko Kyō). From this simple scenario, Ozu builds, one exquisite image at a time, a saga of profound humanity and rich understanding. 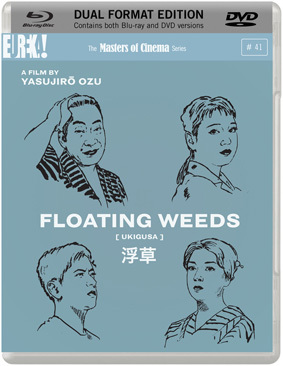 Encompassing a novelistic range of emotions and tones with the utmost delicacy, Floating Weeds stands tall even amidst a body of work as extraordinary as Ozu's. Described by Roger Ebert as being "like a familiar piece of music that I can turn to for reassurance and consolation. It is so atmospheric – so evocative of a quiet fishing village during a hot and muggy summer – that it envelops me," Floating Weeds will be released on UK dual format and DVD by Eureka as part of the Masters of Cinema series on 3rd December 2012 at the RRP of £17.36 for the DVD and £20.42 for the dual format edition.